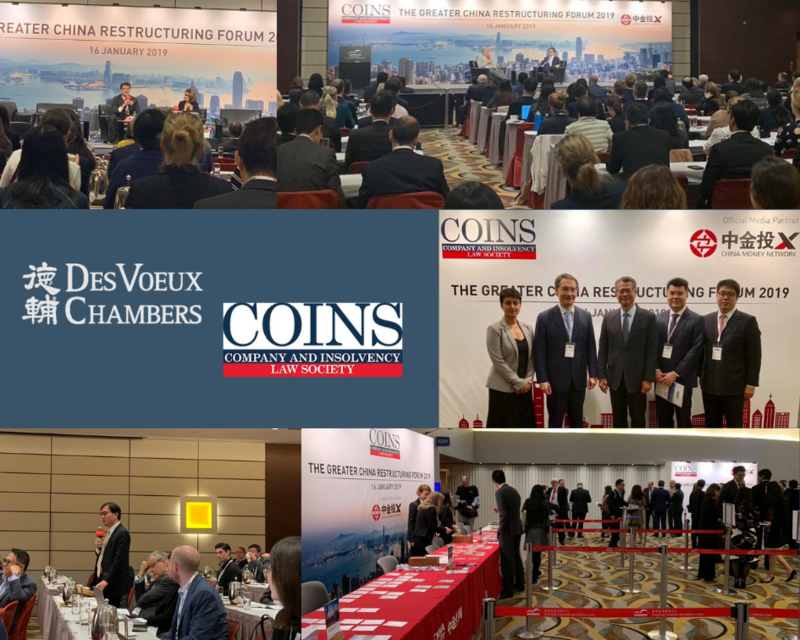 Incisive discussions around Hong Kong's role in international debt restructuring for Chinese businesses, and Hong Kong serving as the platform for international distress featured as part of the COINS Greater China Restructuring Forum held on 16 January 2019, during Hong Kong’s International Financial Week. COINS is the acronym for Company & Insolvency Law Society. Over 200 attendees came together at the Hong Kong Convention Centre in a Conference that broke ground given that it was the first of its kind in Hong Kong in the insolvency context, especially in Asia. A number of DVC’s members attended including William Wong SC, Douglas Lam SC, José-Antonio Maurellet SC, and co-founders of COINS, Michael Lok and Look-Chan Ho. DVC’S Head of Chambers, John Scott QC, SC, JP, William Wong SC and José-Antonio Maurellet SC are members of COINS. The Hon. Mr. Justice Harris, in his capacity as the Honorary President of COINS and Judge of the Court of First Instance of the High Court, delivered the lively opening remarks and this was followed by engaging keynote addresses by Hong Kong’s Financial Secretary, The Hon. Paul Chan Mo-po, GMB, GBS, MH, JP and Marc Lasry, Chairman, Chief Executive Officer and Co-Founder of Avenue Capital Group. Converging at the high-level event were a diverse range of luminaries, including HK’s Official Receiver, and a panel of eminent judges hailing from 5 different jurisdictions. The Hon. Paul Chan shone a light on Hong Kong’s cardinal facets and it’s unique features which make it an ideal hub for attracting global businesses and international investors. This included Hong Kong’s strategic location as a connector between Mainland China and the rest of the world. Hong Kong’s unique selling points and key differentiators as the world's biggest offshore Renminbi hub, coupled with it’s positioning as Asia's chief asset management centre enabled it to leverage multiple opportunities stemming from the Belt and Road Initiative. Taking an optimistic tone, he referenced Hong Kong’s unswerving commitment to forge ahead with introducing a statutory corporate rescue procedure; aligning it with comparable global regimes, including the UK and Australia. He also analysed issues relating to cross-border insolvency and set this against a backdrop that would require a large international co-operation framework. In a buoyant and high-level Q&A, José-Antonio Maurellet SC interviewed Hong Kong’s Official Receiver, Phyllis McKenna as they peeled back the layers of Hong Kong's Restructuring System and Ecosystem. Andrew Brown, Partner, Macro and Strategy ShoreVest Capital Partners examined China's Macro Economic and Distressed Credit Opportunities. This was followed by a panel of speakers who concluded the morning session with a wrap up of Distressed Debt and their take on Finding Value and Opportunities in a Hot Market. This session was moderated by Teresa Ko, Freshfields’ China Chairman. ​Robert Petty, Co-Chief Executive Officer, Co-Chief Investment Officer, Clearwater Capital Partners and Henny Sender, Chief Correspondent, International Finance, Financial Times delivered the final keynote address before the networking lunch began. In the afternoon, a distinguished panel of judges including The Hon. Judge Martin Glenn, United States Bankruptcy Court, The Hon. Mr. Justice Alastair Norris, High Court of England and Wales, The Hon. Justice Aedit Abdullah, from the Supreme Court of Singapore, The Hon. Justice Nicholas Segal, from the Grand Court of the Cayman Islands, collectively delivered an edifying and inspirational presentation in a Judicial Colloquium, which centred around The Court’s Role in Cross-Border Chinese Restructuring. This was moderated by The Hon. Mr Justice Harris. A portrait of the shifting tectonic plates underscoring China’s Changing Bankruptcy Law (Reform) was outlined by the The Hon. Judge Wang Fang, of the Shenzhen Intermediate People’s Court. She also spoke at the 2nd Annual GRR Live event held on 6th November 2018. The Hon Mr. Justice Harris brought the day to a satisfying end with upbeat Closing Remarks that reinforced Hong Kong’s key advantages and restructuring expertise.